I feel less worried and even crack a smile now when friends and colleagues ask me about my honeybees. 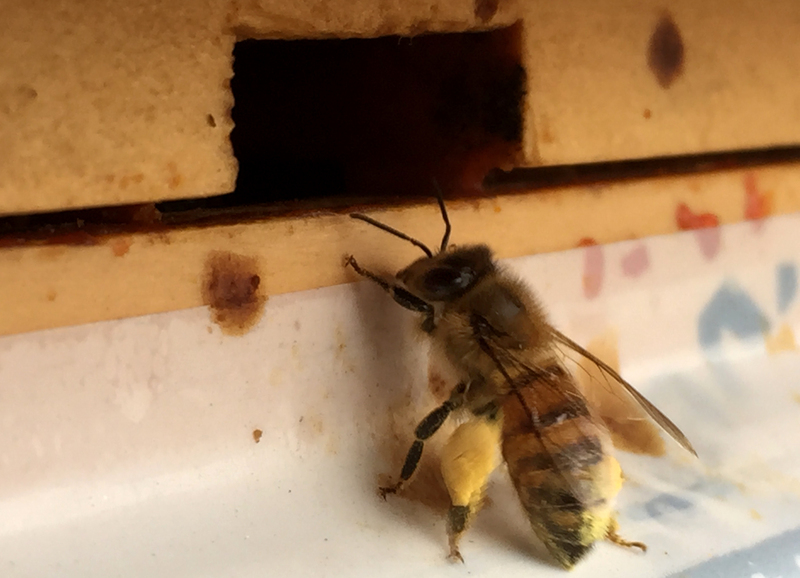 It was above 50° F yesterday and bees from hive #1 came out in droves. They mostly used the top entrance; only once in a while one or two bees would enter or exit the bottom entrance. I saw a couple of bees go inside hive# 2 but I wasn’t sure that they were bees from that hive. Maybe they were bees from hive #1 that were disoriented and went in there by mistake. Accidental incursions into the wrong hive usually results in the interloper being chased out by the resident honeybees. I wonder if there is any ceremony like the Navy’s tradition of covering an aircraft with graffiti if it lands accidentally on the wrong carrier. Anyway, the other four hives still show no activity but it has been only a little bit above 50 degrees so far. I still have hope for the rest that I’ll maintain until it’s warm enough for me to open them up to find out for certain. The hives will stay wrapped up until daytime temperatures stay consistently above 50°F and nighttime temp’s won’t go below freezing. I keep checking the weather to see if any of my days off from work will coincide with a good sunny and warm day. I really want to do an inspection, remove the inner winter cover, switch the supers, and clean the bottom board. I don’t use any chemical treatment on the hives. I provide a variety of organic flowers and clean water only and let them live naturally. So a clean hive is a healthy hive. In early spring, the maple trees are blooming and that’s where the bees are getting their pollen and nectar from. Some snowdrops and crocuses in the garden also contribute. Not much else is available aside from these flowers. But the girls were really busy and we are very happy. Even if only one out of five hives survive this winter of below 0° F days, we are happy. It will mean they have adapted to the winter weather in our area and will build an even stronger generation, passing good, strong genes on. Here’s a video of them cleaning and foraging. I took this video with an iPhone, so please pardon the shaky images. Below, one of the girls with a heavy load for the colony. Good news about your bees. They must be a hardy lot to get through this winter. I enjoyed watching them in the video. It’s great news for us. We didn’t think they will pull through -11 degrees. We purchased the original packages from Georgia a couple of years ago but some died during the winter. The bees we have now were born in our garden and they seem to have evolved very fast.